near the town of Maikop, Republic of Adygei, Russian Federation. At the same time and place the IXth Championship of Russia will be held involving a great amount of cavers from the different parts of the country. The aim of the Festival is to share skills, opinions and experience among cavers from all over the World. The races of the Competitions will give the opportunity for everybody to check and show your skills level and to become the Champion. The participants will compete on individual distances as well as team distances for 2 and 4 sportsmen. The distances will simulate different kinds of underground works. 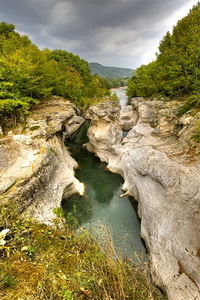 Russian Federation, Republic of Adygei, Kamennomostskiy township (40 km to the South of the Maikop city), “Hadzhohskaya tesnina” canyon. This is a place of recreation and excursions attracting lots of tourists each year.The place of competition is well-known for its nature and developed tourism facilities. During the Festival you will have a great opportunity to visit nature reserve Lago-Naki which is well-known in Russia for its beauty and local caves. It will be possible to make rafting on river Belaya, watch competitions of Russian mountaineering, boating, backpacking tourists and travelling cyclists which will take place there at the same period of time. The Kamennomostskiy township is located 40 km to the South of the city of Maikop which is the capital of the Republic of Adygei. You can get to Maikop by train or by bus from the city of Krasnodar where the nearest airport is situated. The transfer from Maikop to Kamennomostskiy township will be organized. Anyway you can easily get to the place of the event by your own car. The organizers offer to the participants various ways for accommodation – hotels, huts, camping with bungalows or own tents – all on pedestrian distance (up to 20 minutes) from the place of the Festival. Additional information will be given on the request. Preliminary program, participation application and the information on the Participation fee of the Festival will be available in the nearest future. Commission of Sporting Tourism Union of Russia.